TNF-a induces the synthesis of both IL-1 and IL-6 in macrophages. In contrast, IL-10, which is also synthesized by macrophages, inhibits the synthesis of TNF-a, IL-1 and IL-6. Both IFN-g and TNF-a can activate macrophages, which subsequently synthesize TNF-a and IL-1. What I am trying to elude to is that depending on the microenvironment which contains many cytokines, the pattern of cytokines matters whether the macrophages are activated or not. This does not take into account the suppressiveness of the Tumor’s activity. Melanoma tumors can secrete TGF-b and IL-10 and other suppressive molecules. 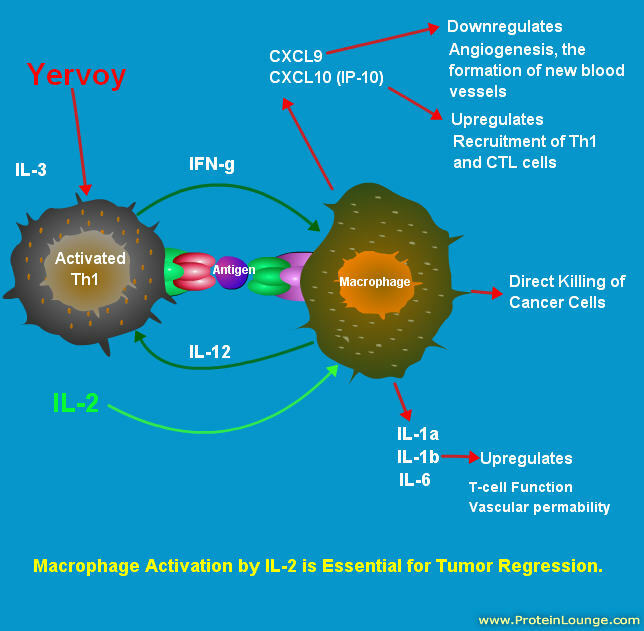 These suppressive cytokines (IL-10) can block the activation of the tumor associated macrophages (TAMs) which in turn inhibits the secretion of other cytokines and chemoattractants into the Tumor’s microenvironment. 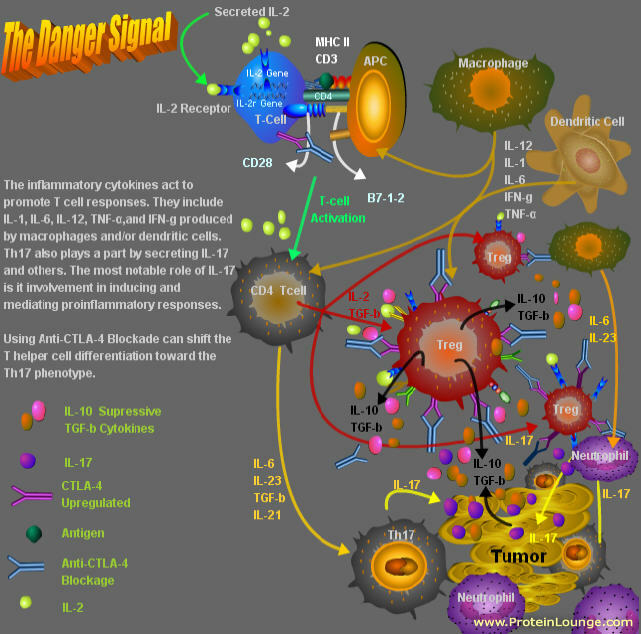 This inhibition suppresses the “Danger Signal” needed to alarm the immune system of foreign invaders (Tumor cells). 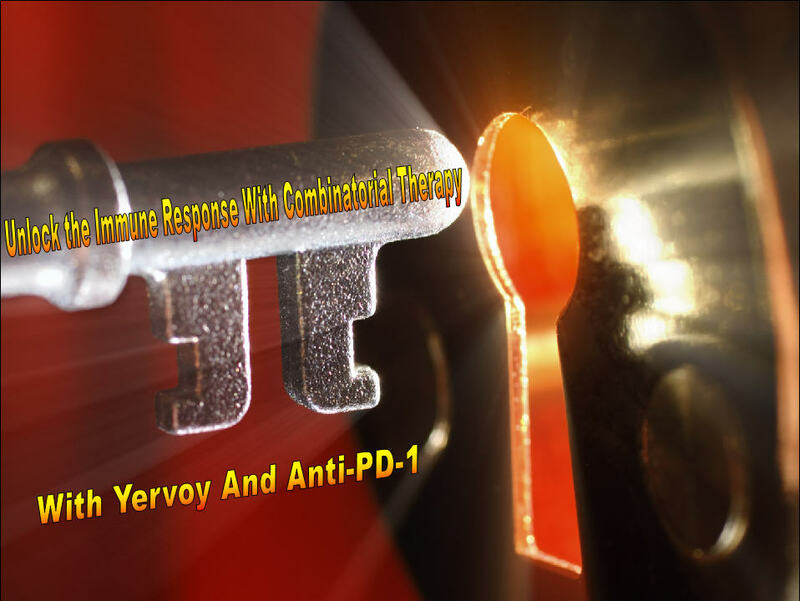 So administration of HD IL-2 during the peak propagation of the (ALC) Absolute Lymphocyte Count (7 weeks or 49 days) may be synergetic to Yervoy. 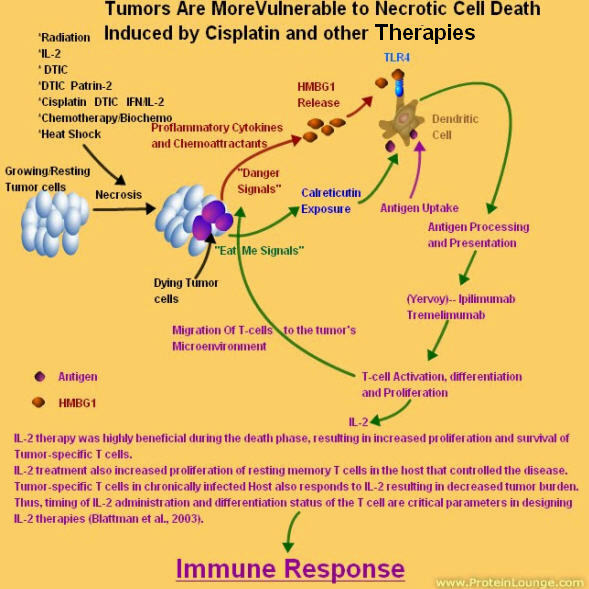 "Immunotherapeutic approaches for the treatment of melanoma, such as tumor antigen-based vaccines, can frequently boost immune responses. However, clinical responses as measured by tumor shrinkage are seen in only a minority of patients. This observation has prompted careful analysis of the tumor microenvironment for biologic correlates to clinical response and also to identify mechanisms of tumor resistance. Patients with advanced melanoma treated with antigen-specific vaccines had pre-treatment tumor biopsies analyzed by gene expression profiling. 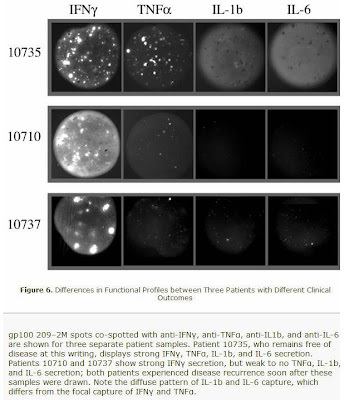 Supervised hierarchical clustering was performed based on clinical outcome. An expanded bank of tumors was analyzed to increase the sample size and better understand gene patterns. Two major categories of melanoma metastases have been observed. One subgroup of patient has an inflamed phenotype that includes expression of chemokines, T-cell markers, and other immunoregulatory factors. Clinical responders to melanoma vaccines appear to fall within this subset. This group also contains the highest expression of negative regulatory factors, including PD-L1, IDO, and FoxP3, suggesting that these immunosuppressive mechanisms may dominantly inhibit anti-tumor –cell function in those patients. In addition, absence of B7 expression supports classical T-cell anergy. Preclinical experiments have confirmed a critical role for these mechanisms in limiting anti-tumor T–cell efficacy in vivo, giving candidate treatment strategies for translation back into the clinic. A second subset of patients is represented by tumors which are non-inflamed and lack chemokines for T cell recruitment. Therefore, a major barrier in these cases appears to be failed T –cell migration into tumor sites. Experimental strategies to augment T-cell migration can have important anti-tumor effects in preclinical models. The presence of the "inflamed" gene signature was associated with a type I IFN transcriptional profile, and murine experimental models have confirmed a critical role for type I IFN signaling in promoting adaptive immunity." 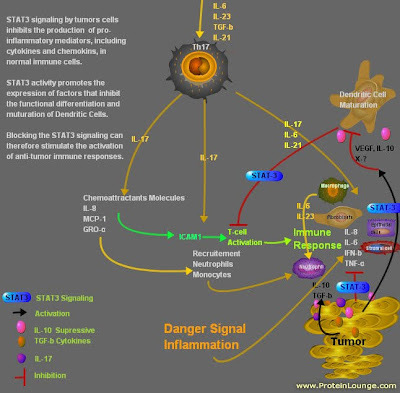 The second subset was missing the "danger signal" inflammatory cytokines and chemoattractants most likely due to STAT3 signaling from the Tumor. Stimulation of Toll-like receptor 4 (TLR-4) activates macrophages and results in the release of TNF-alpha. 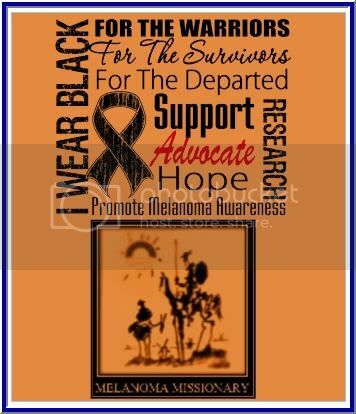 It is hypothesized that melanoma inhibits macrophage activation by suppressing TLR-4 signaling. Activated macrophages defend against tumors by secreting cytokines to recruit secondary immune cells, presenting antigen to T cells, and by direct tumor cytotoxicity. Peritoneal macrophages harvested from melanoma-bearing mice are less cytotoxic to melanoma cells, and produce less superoxide, nitric oxide, and tumor necrosis factor-alpha (TNF-alpha) than those from nontumor-bearing mice. Similar impairment of macrophage activation occurs in vitro using media harvested from cultured melanoma cells. Interleukin 6 is a pro-inflammatory cytokine and is produced in response to infection and tissue injury. IL-6 exerts its effects on multiple cell types and can act systemically. Interleukin-1b is a pro-inflammatory cytokine which is secreted by macrophages activated by a number of stimuli including TNF-alpha, bacterial endotoxin and IL-1b itself. IL-1b exerts its effects on many different cell types locally at the site of production and systemically (at a distance). Interleukin-12 is a heterodimer consisting of a p35 and a p40 subunit. Both subunits are required for receptor binding and biological activity. 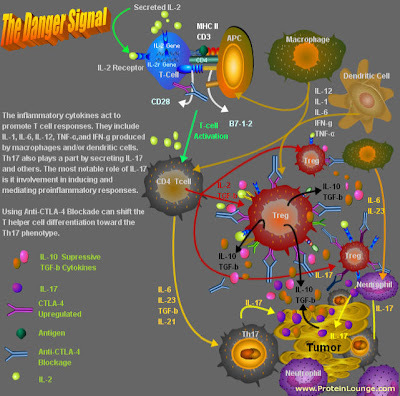 IL-12 stimulates growth of activated Natural Killer (NK) cells, CD8+ and CD4+ T- cells. IL-12 increases NK and T-cell g-IFN production which shifts T-cell differentiation towards a Th1-type response. IL-12 increases NK production of TNF-alpha which can act synergistically with IFN-gamma. 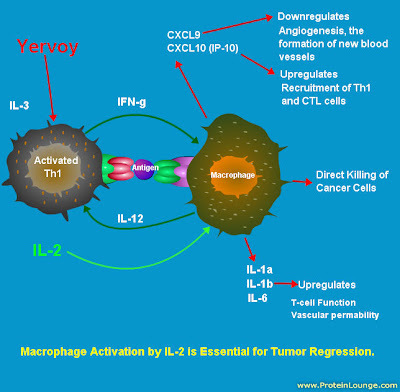 IL-12 suppresses IL-4 induced IgE production. Tumor Necrosis Factor alpha is made by many other cells as well as macrophages, which are major sources, especially after priming by Interferon gamma. TNF-alpha initiates a cascade of cytokines which mediate an inflammatory response. TNF-alpha effects are mediated through two types of receptor, a 75kDa TNFR-a receptor and a 55kDa TNFR-b receptor. TNF-alpha regulates the expression of many genes in many cell types important for the host response to infection. Macrophages, and many other cells produce these Type I interferons which act as immunomodulatory, as well as antiviral cytokines. Distinct receptor from interferon gamma, mediates overlapping or competing effects on macrophages. Cellular signalling pathways involve Jak/Stats, and other pathways. So, if Melanoma suppresses Macrophage Activation, then the tumor microenviroment is missing IL-6, IL-1b and other cytokines. If you look at the above micrographs, you will see that the two patients that had relapsed (10710 and 10737) Had IL-1b and IL-6 missing. 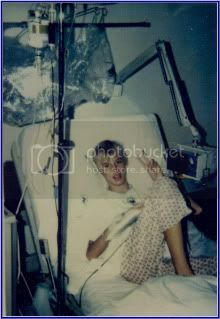 The macrophages were not activated!!!! The "Danger Signal" known as inflammation was missing! The missing combination of IL-1 and IL-6 meant there is no T-cell activation. And no induction of the Th17 phenotype. It is now becoming a lot more clearer based on Dr. Gajewski's findings. Now might be the time for a critical re-evaluation of our overall approaches to targeting STAT3 and for developing new models for disrupting the protein in order to accomplish the goal of delivering clinically useful direct STAT3 inhibitors as novel anticancer agents in a timely manner. MedImmune inked an in-license agreement with Pfizer for tremelimumab, a mAb therapeutic for various types of cancer. Pfizer presented final toxicity results of a Phase I dose-escalation trial of tremelimumab in combination with gemcitabine in chemotherapy-naive patients with metastatic pancreatic cancer. Under terms of the deal MedImmune will assume global development rights to tremelimumab. Pfizer retains rights to use the drug compound with specified types of combination therapies. Pfizer previously signed over developments rights covering tremelimumab in melanoma to Debiopharm after the mAb failed in a Phase III melanoma trial. The interim analysis found that it would not offer any benefit over standard chemotherapy. Thus in April 2008, Pfizer was forced to halt the trial. A full evaluation of the data revealed a biomarker that predicted patients who were more likely to respond, according to Pfizer. Debiopharm will be responsible for conducting a new Phase III study that leverages this marker to select patients with unresectable, stage IV melanoma. At the time of inking the deal with Debiopharm, Pfizer said it would retain all commercial rights. Tremelimumab is a fully human mAb that binds to the protein CTLA-4, expressed on the surface of activated T lymphocytes. "Adding another immunotherapeutic approach to our oncology pipeline, one which may employ the immune system itself to fight cancer, exemplifies our continued commitment to embracing this new era of cancer care," says Bahija Jallal, Ph.D., MedImmune's evp, R&D. MedImmune has seven clinical-stage mAb programs for cancer treatment. Phase I candidates bind to CEA and CD3, CD22, IGF, CD19, and Ang2. 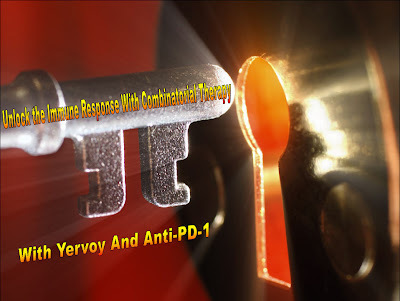 The Phase II candidate targets PDGFRα and is being tested in lung cancer and glioblastoma. The company believes that the platelet-derived growth factor receptor alpha (PDGFRα) pathway, with its potential role in regulating transformation as well as tumor microenvironment, progression, and metastasis, may be an important cancer target. MEDI-575 is a fully human mAb to PDGFRα being tested in lung cancer. It has been shown to inhibit signaling from PDGFRα on cancer cells and supportive stroma. However, MEDI-575 reportedly does not inhibit PDGFRβ, the inhibition of which has been associated with significant clinical toxicities including extravascular fluid accumulation. Bristol Myer Squibb will now be looking in the rearview mirror and seeing MedImmune in it. Down the road we may see the price of these anti-CTLA-4 antibodies go down. Also MedImmune has an US Patent Application 20100028330 - METHODS OF UPMODULATING ADAPTIVE IMMUNE RESPONSE USING ANTI-PD1 ANTIBODIES. This is becomming Very Intersesting!!! A race for the CURE!!!!! It is good to see some Competition.